There are many reasons to celebrate with your mom & baby group during March. Here are a few bizarre March holidays that provide a great reason to celebrate! National Craft Month: Children love crafts and so do most moms! This is one of the bizarre March holidays that can be celebrated all month long! You can celebrate by creating crafts during some of your play dates. You could ask for mom volunteers to lead the craft sessions since many moms have great craft ideas to share. National Nutrition Month: This would be a great month to plan for a Public Health Nutritionist guest speaker. Sing With Your Child Month: The great thing about singing with your children is that they don’t judge or criticize your lack of musical ability. 🙂 Children love singing along to tunes or listening to their parents sing to them. Try bringing along a cd of tunes to your play date so the moms and little ones can share in a musical play date. Dancing and singing is a great way to celebrate this bizarre March holiday! Spiritual Wellness Month: Multi-tasking is a skill all moms are very familiar with. We’re always so busy with day-to-day responsibilities that it’s important to take time out to relax. Try contacting a baby & me yoga instructor to see if they would put on a sample class for your mom and baby group. National Chocolate Caramel Day (March 19th): Any holiday with “chocolate” in the title is a great reason to celebrate! You could bring a few chocolate caramel desserts to share with the group. 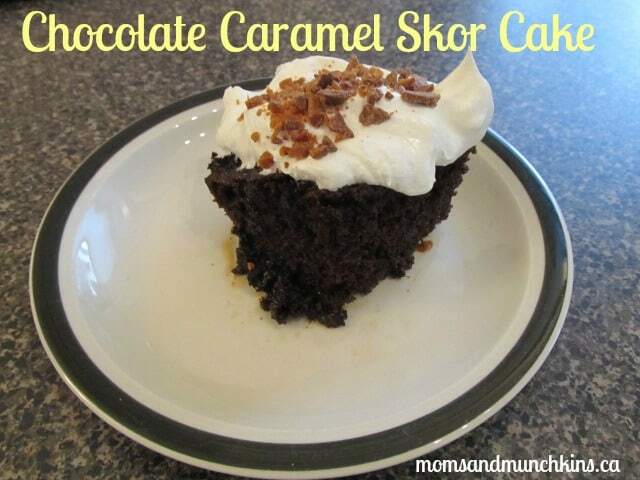 Try this delicious Chocolate Caramel Skor Cake. Make Up Your Own Holiday Day (March 26th): Let your imagination have no limitations today while celebrating Make Up Your Own Holiday Day! Invite each mom & baby to come to your play date to celebrate something important to them and to share their made-up holiday with the group. Have you head of other bizarre March holidays worth celebrating? Stay updated on all the fun ideas for silly holidays by following us on Facebook, Twitter, Pinterest and Bloglovin’.